United Church diaconal ministry has had a long tradition of symbols that help to define and shape the community. The wearing of a pin is a long standing practice, initiated in the founding Orders of the Presbyterian and Methodist Churches. The pin featured to the left was given to women designated as Deaconesses beginning in 1927 until 1964. 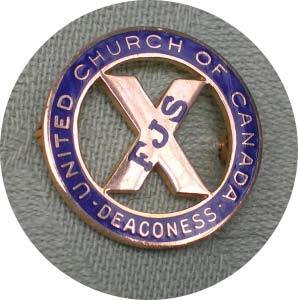 (In 1964 the Deaconess Order underwent significant change and the practice was discontinued.) Women wore the pin, in the early days on their uniform (see more below) and when not wearing a uniform, to identify themselves. When women were disjoined from the Deaconess Order upon marriage, in many years they were asked to return their pin. Refusing to do this was an act of protest at the injustice perceived in the disjoining, and particularly in the loss of their Deaconess Status. Ruth (Sandilands) Lang, who was disjoined in 1956 was one of the women asked for her pin back during the Deaconess Association Meeting by the Executive Secretary of the Order, Tena Campion. Mrs. Campion explained to Ruth that someone might lose hers and need a replacement. “Well then I’ll buy her one. YOU CAN’T HAVE MINE,” was Ruth’s response. Ruth proudly wore the pin at the United Church service of apology to disjoined women in 2006. (For more on the disjoining click here.) The letters FJS stand for “For Jesus’ Sake”, a motto reflecting the commitment and accountability for the ministry of service carried out by the women. In 2011, DUCC embraced the tradition of a pin again, this time one that can be worn by anyone who is a member of DUCC or who considers themselves to be in diaconal ministry. 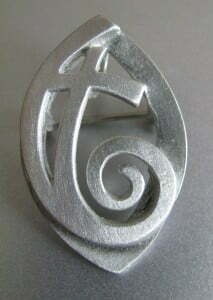 The DUCC PIN/PENDANT was created in pewter by Robert Hall Originals from a design by Joyce Crosby. This logo utilizes the shape of the United Church crest, with the cross and the spiral. The design has also been adopted as the logo for DUCC. It is perhaps no surprise that by the 1920s, as women are gaining more emancipation, particularly around clothing, discomfort at having to be so controlled is expressed by the Deaconesses. From then on there is never a period up until the late 1940s when the uniform falls out of use that it isn’t a point of discussion, and contention among the women. Coats shall be made of blue serge without a cape, semi-fitting, with plain lapped seam, length six inches from bottom of skirt; the coat sleeve and collar of which may be trimmed with fur, preferably dark; the lining of the coat to follow individual taste, having regard for the climate in which it is to be worn. 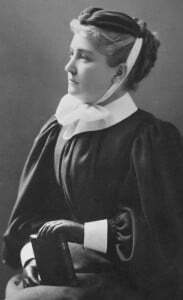 Jean Scott, Superintendent of the Methodist Deaconess Home and School circa 1897 wearing the prescribed navy blue uniform of the day. This circa 1945 United Church Deaconess Uniform belongs to the Centre for Christian Studies. 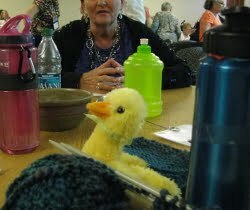 This little DUCC joined Sharilynn Upsdell at the 2011 DOTAC meeting in Oklahoma City.